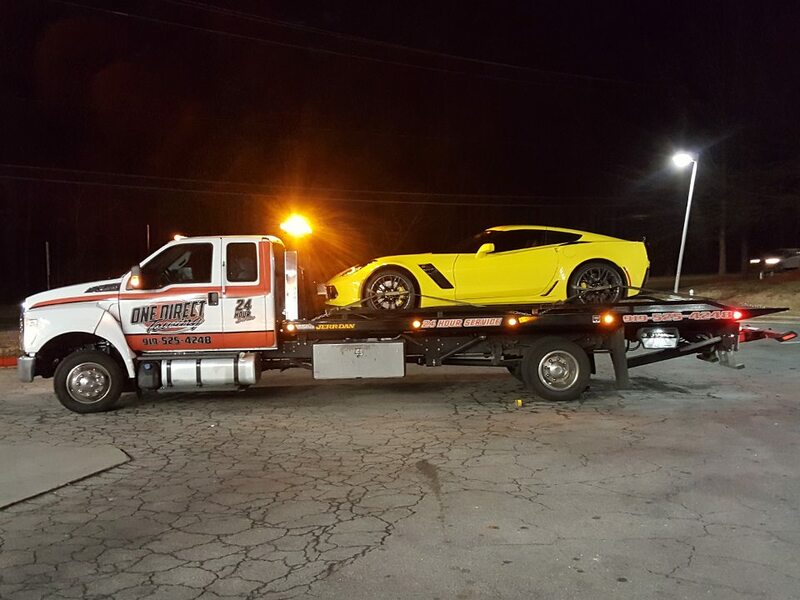 One Direct Towing and Storage LLC specializes in 24-hour towing and roadside assistance. 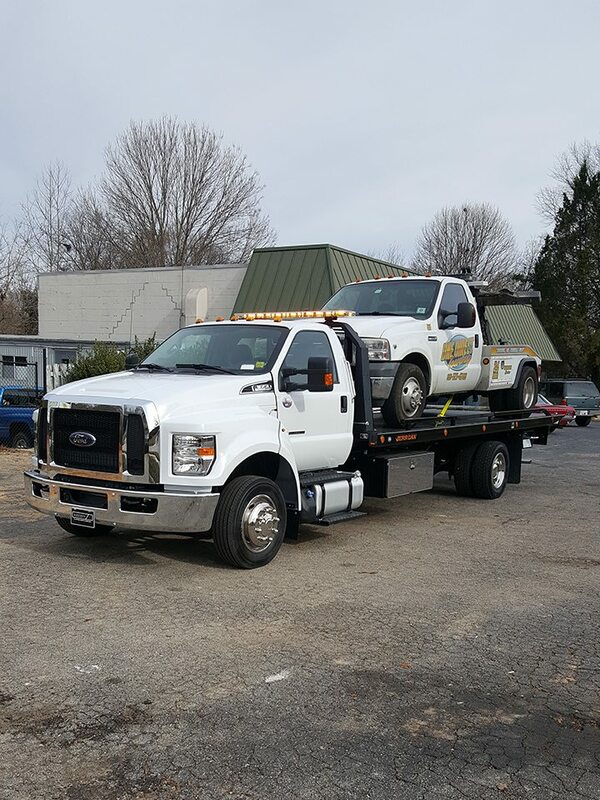 Depend on us for all your towing needs. 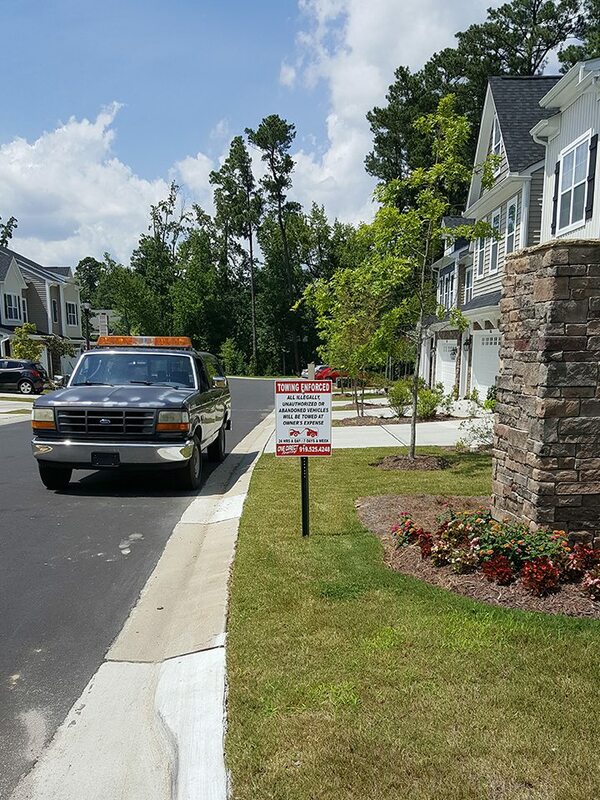 We provide emergency and non-emergency towing as well as parking management for property owners and managers. Located in Cary, NC, we serve the surrounding area as well. 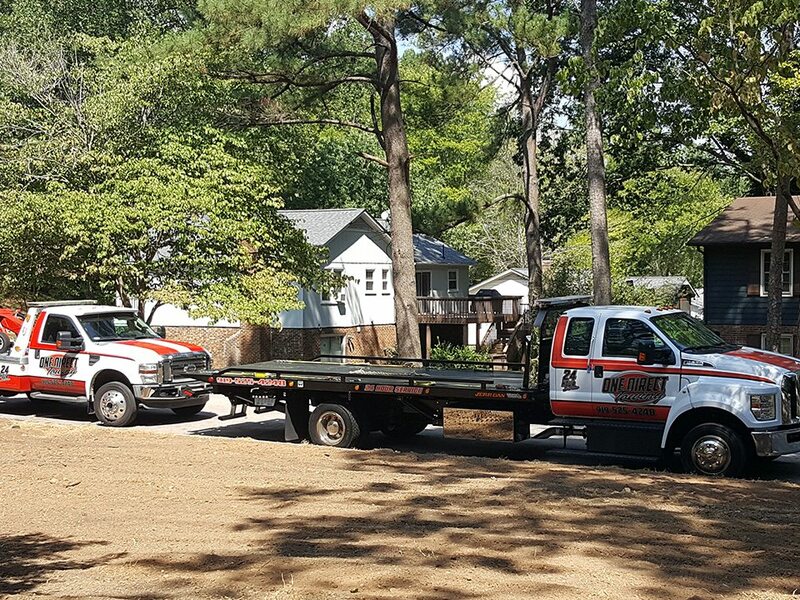 Our fleet of wreckers and flatbed tow trucks is always ready to respond to emergency situations. Call anytime! Dispatchers are standing by 24 hours a day, 7 days a week, 365 days a year. 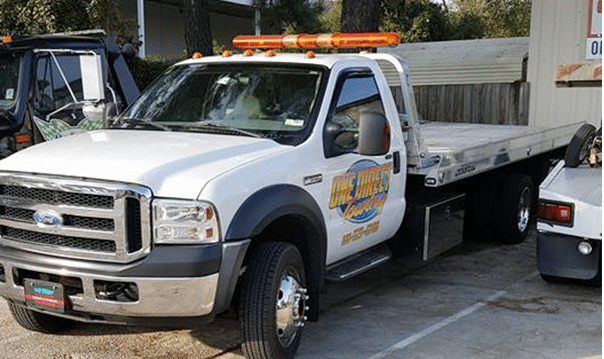 From fixing flat tires to towing disabled vehicles away, One Direct Towing and storage LLC is there when you need us most. 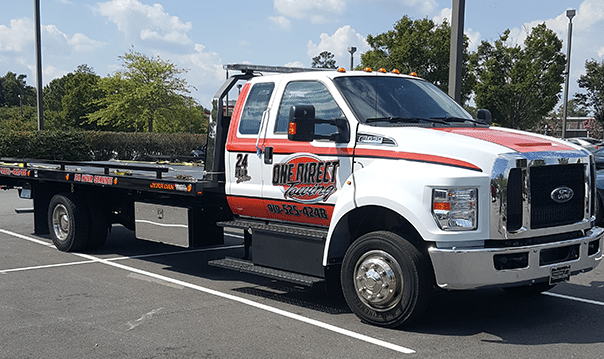 One Direct Towing and Storage LLC is family owned and operated. 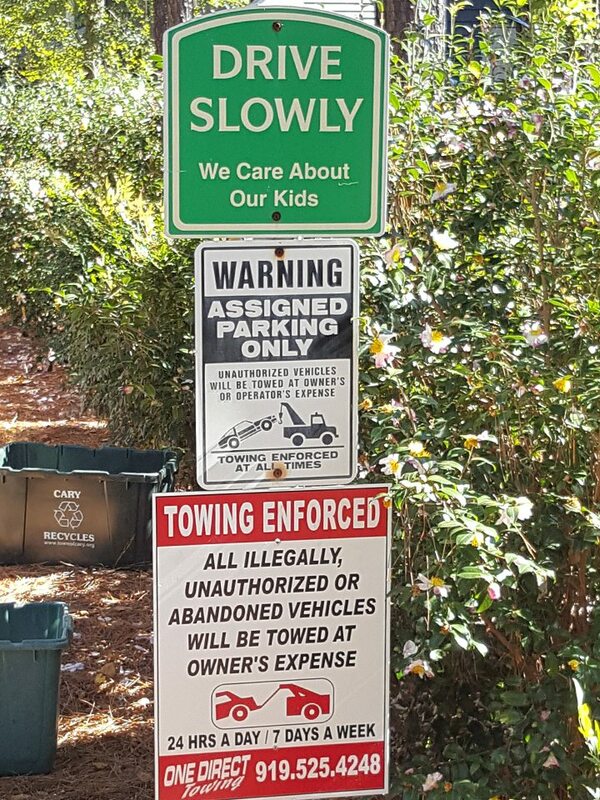 We run our towing company with integrity. We will never give out an ETA we can’t keep. Expect honesty from all of us at this company. 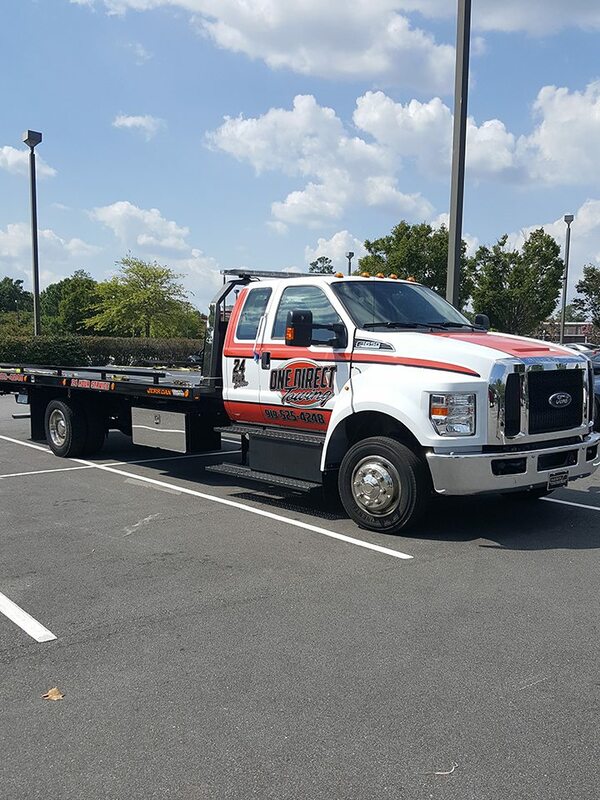 All our tow truck operators are thoroughly trained and have at least 15 years of industry experience. We have police rotation contracts and have passed strict background checks, including Highway Patrol and RDU Airport Authority. 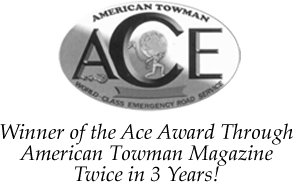 Our shop was the winner of the Ace Award from American Towman Magazine twice in 3 years for professionalism and service reliability. We are committed to providing service that is fast and fine. 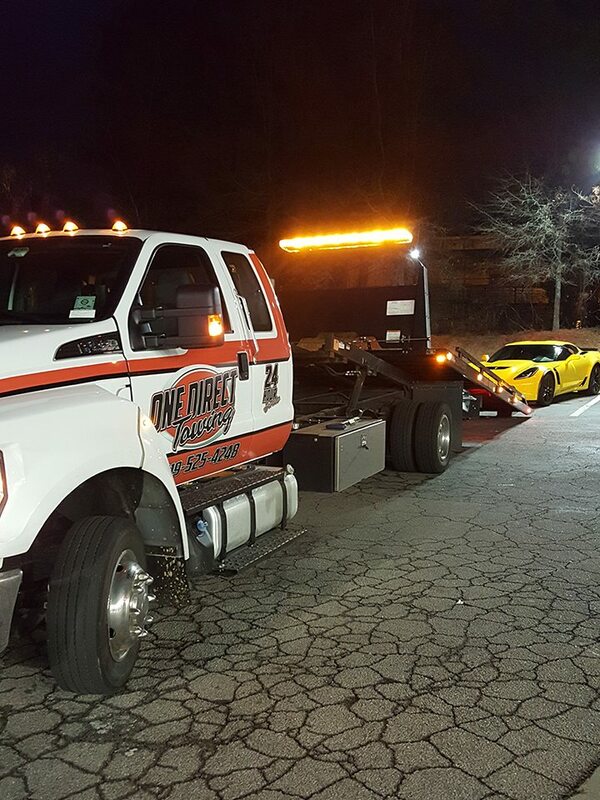 One Direct Towing and Storage LLC specializes in 24-hour towing and roadside assistance. We also provide parking management and junk vehicle removal. 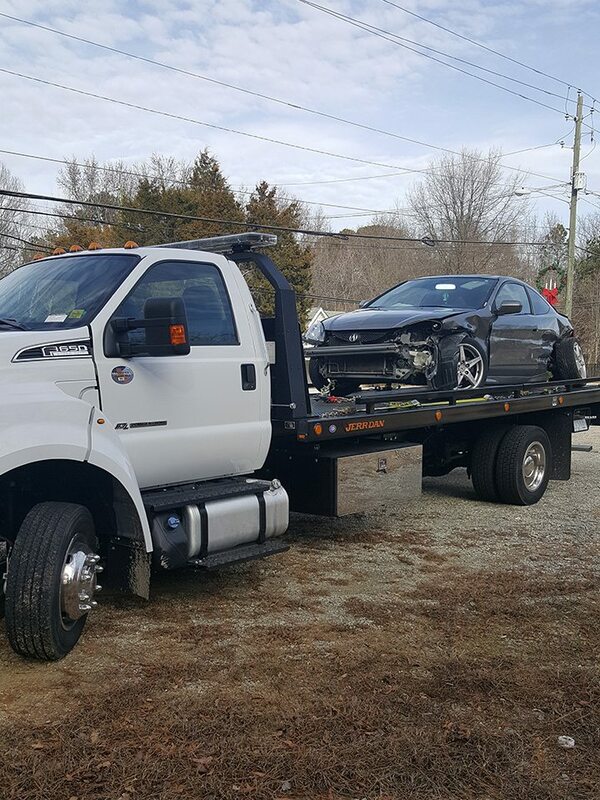 Proudly serving the triangle area, we handle it all from roadside battery jumps to fast towing after an accident. 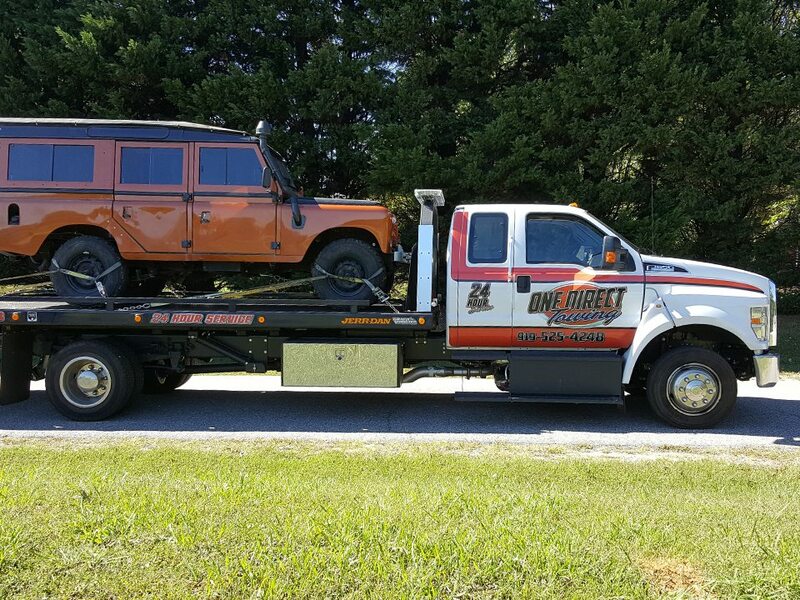 Depend on us for all your towing and roadside emergency needs. 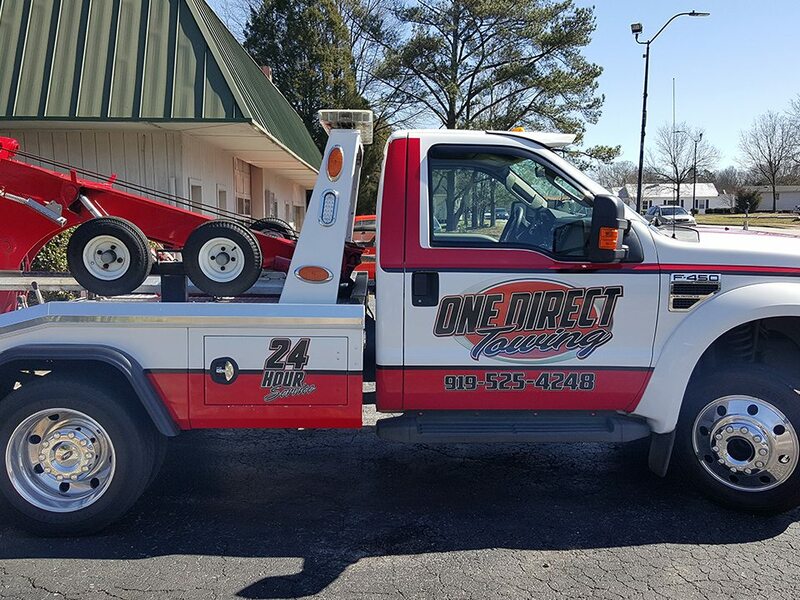 One Direct Towing and Storage LLC is a family owned and operated towing facility. 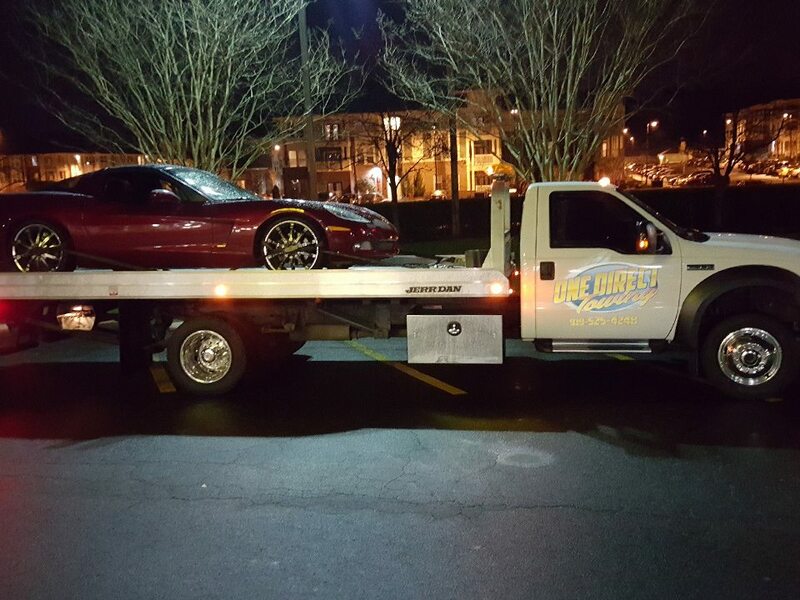 Towing and roadside assistance is what we do best. 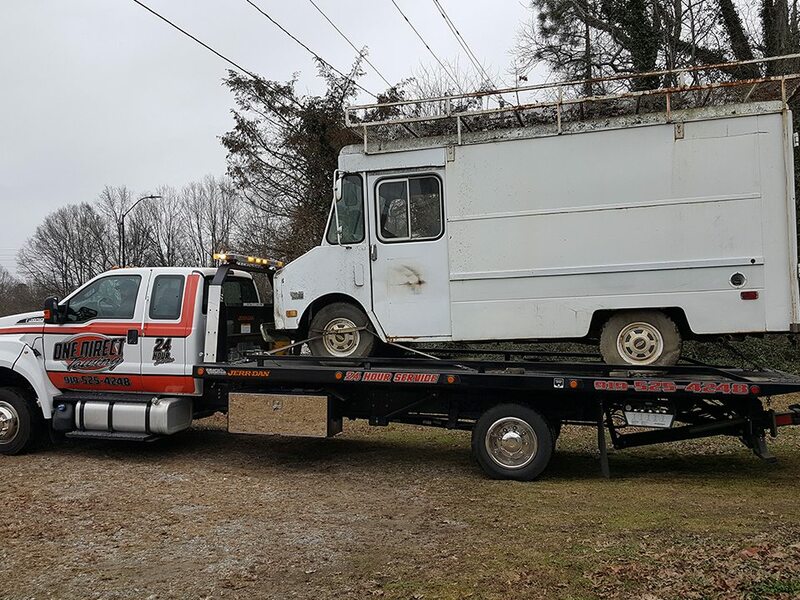 We provide emergency and non-emergency vehicle transportation services, junk vehicle removal and parking enforcement for landlords and property management. In four short years, we have grown from a small 1-truck operation to a 5-truck towing facility. Our company is still small but it is driven by our enormous desire to serve our community. 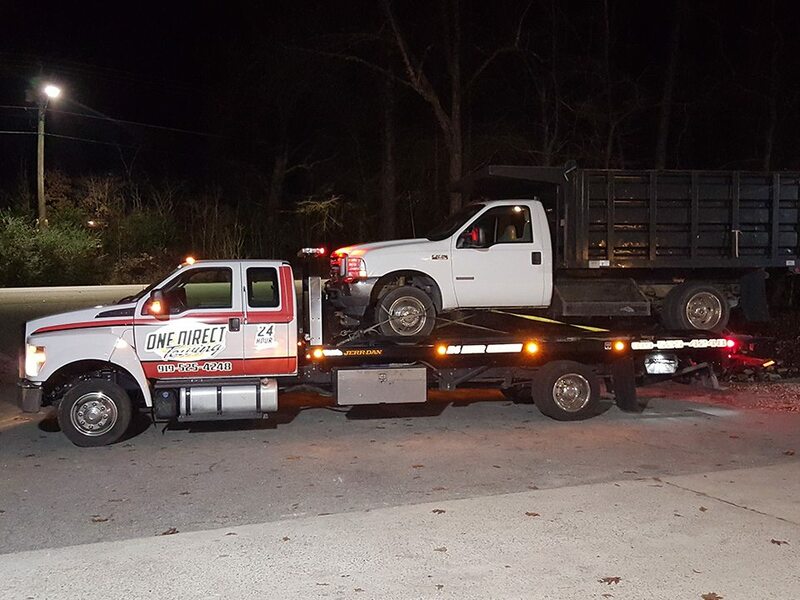 Our experience in the towing industry has shown us that a large facility doesn’t necessarily mean a better one. Companies with many trucks and drivers tend to have bad communication, operating problems, a high turnover in drivers and other driver problems. 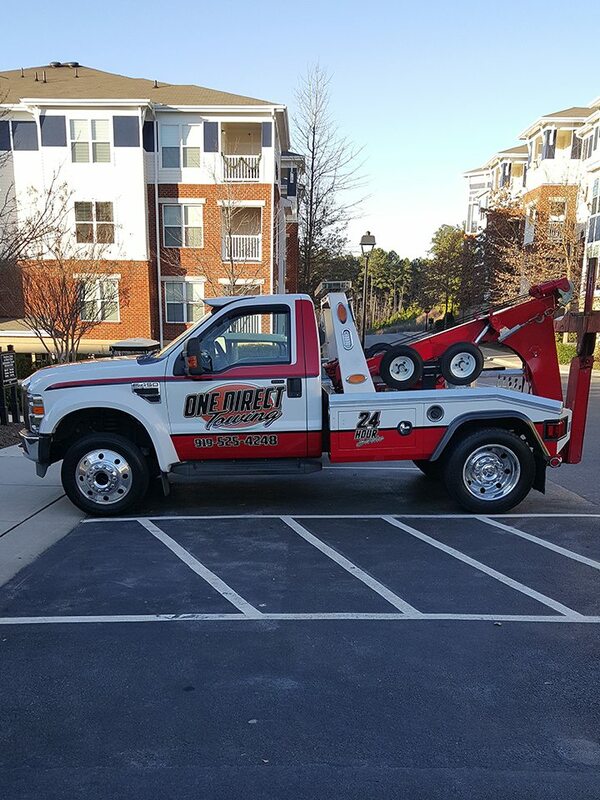 To meet the needs of our community, we aim to offer expert towing and roadside assistance to the triangle area. Our streamlined company is staffed with reliable drivers that have been here for a long time. 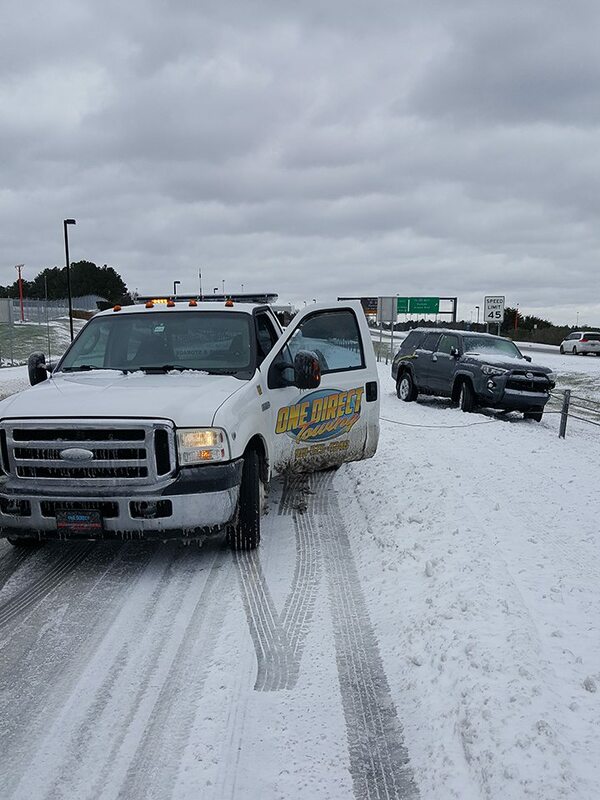 All our tow truck operators have been thoroughly trained and each has at least 15 years of industry experience. Our service and prices are guaranteed to be better than the rest. count on us 24 hours a day, 7 days a week, 365 days a year. 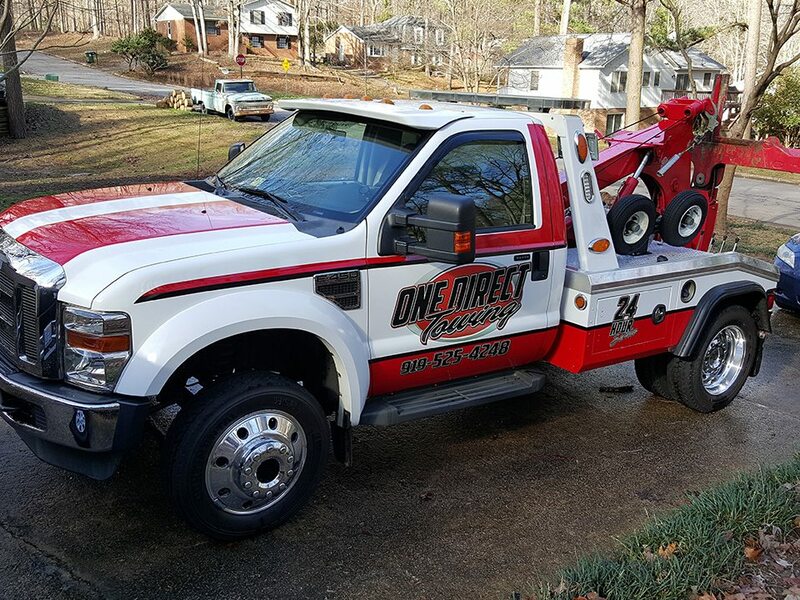 Honest, fast and reliable, call One Direct Towing and Storage LLC whenever you need towing or roadside assistance. My car is all-wheel drive, does it require a flatbed tow truck? Tow dollies are best used with cars that have front-wheel drive transmissions. When the car is towed by the front tires, the back tires roll on the pavement. All-wheel drive vehicles are different. 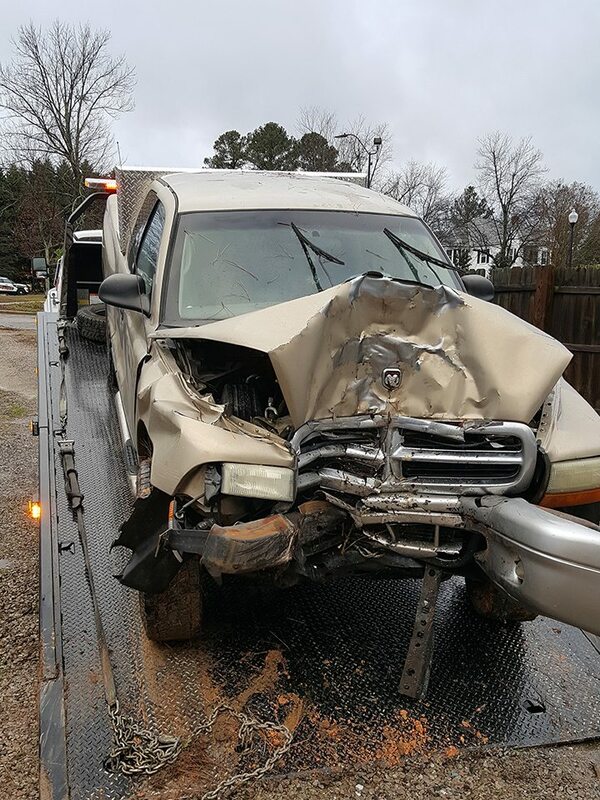 If they are towed by the front wheels only, it may cause serious damage to the transmission. 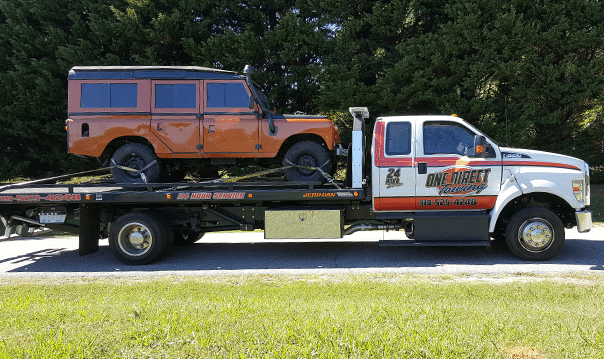 Even if the drive train can be disengaged, flatbed towing is a safer option. With few exceptions, the transmission of every car has limitations as to how far and how fast the vehicle can be towed before the transmission is damaged. This applies to automatic and manual transmissions. When a vehicle is being driven, fluid is circulated throughout the transmission. Transmission fluid serves to cool, lubricate, clean, and in the case of automatic transmissions provide hydraulic power to operate the moving parts. 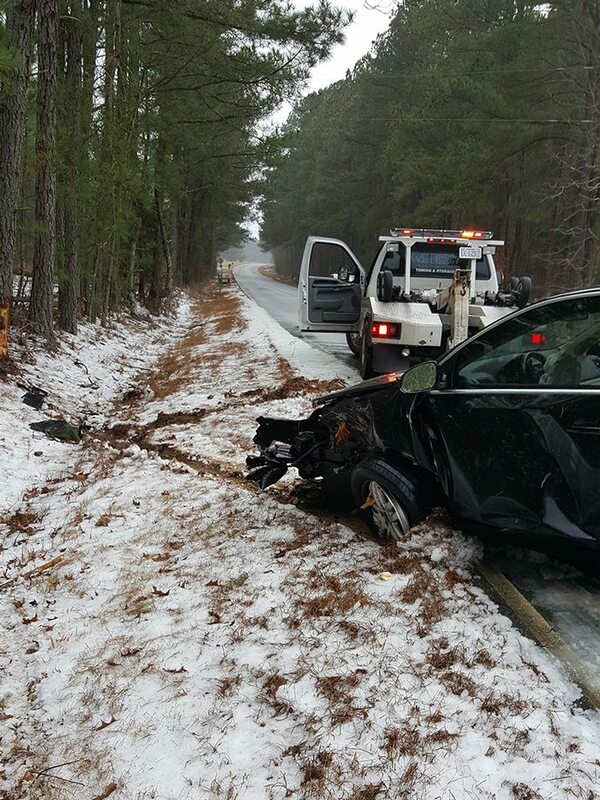 With the exception of some 4-wheel drive and all-wheel drive vehicles, a transmission must be in neutral if the vehicle is towed on its drive wheels. Since the transmission is in neutral, it does not circulate the fluid the same as it would if it was in drive or in a driving gear (manual transmissions) and during towing, the transmission can run hot. 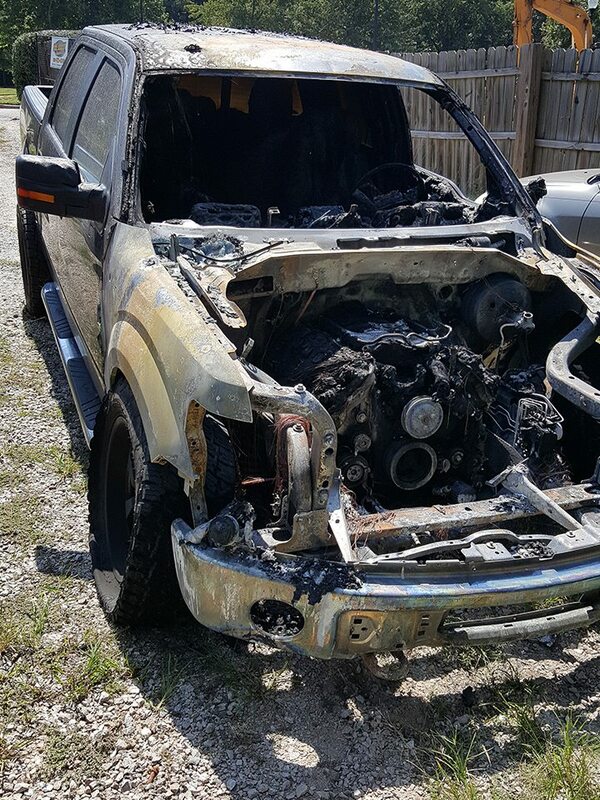 When the vehicle was being driven, it left residual fluid on parts that turn if it is towed or on some vehicles there is limited circulation of fluid that allows for towing within the speed and distance restrictions imposed by the manufacturer. If you exceed the speed or distance restrictions imposed by the manufacturer, the transmission can overheat and be seriously damaged. With so many makes and models, how do you remember each vehicle's towing procedure? Every manufacturer establishes towing guidelines, several companies compile these guidelines into an annual publication that is standard equipment for today's tow truck driver. 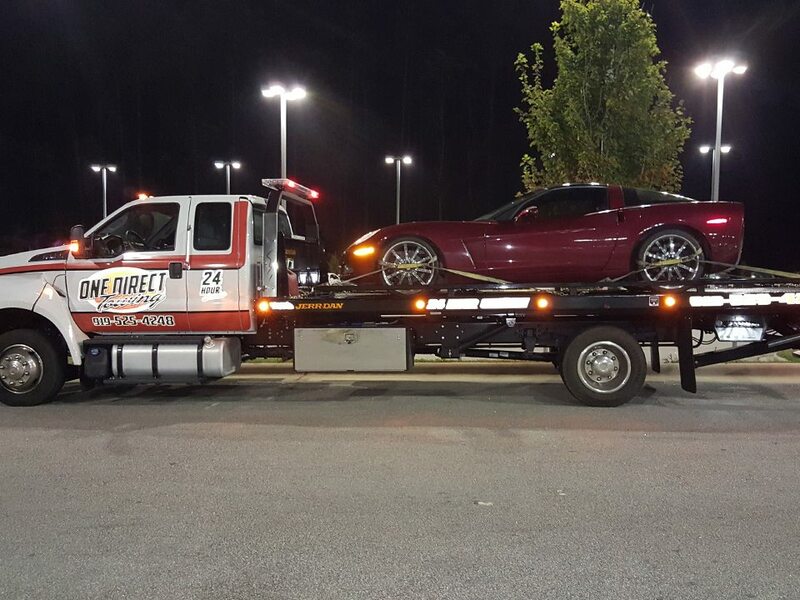 As experienced professionals in the towing business, we know your car is important to you - so it is important to us! 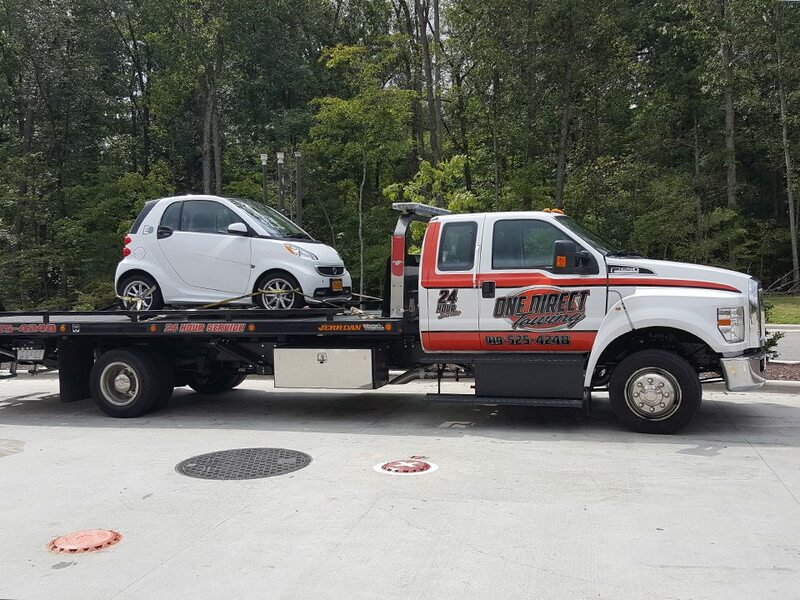 We are sure to keep current with all recommended towing procedures to ensure your car arrives at it destination in the same condition it was picked up. No. Quite the opposite. Since your car is lifted by it's tires, it is riding on your own suspension. And the tow trucks suspension absorbs most of the bumps. However, it is important that you tell your driver any information about your vehicle they may need to know to tow it safely - some modifications may need special handling. You know your car best, so be sure to tell your driver! 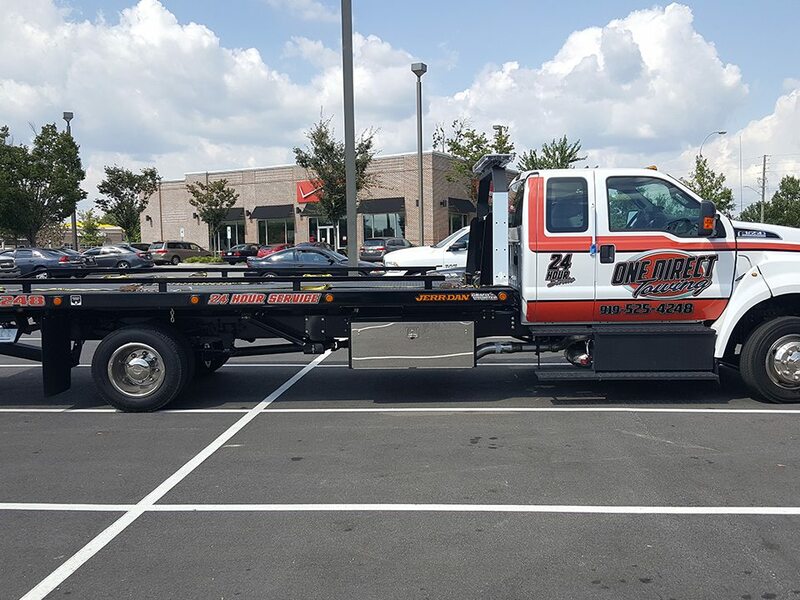 There are basically three types of tow trucks: the conventional low truck with a hook and sling used to raise one end of the vehicle for towing, wheel-lift or full-float trucks that put an extra set of wheels under one or both axles and flat-bed tow trucks that carry the entire car flat on a bed. They type of truck depends on the particular situation: when stuck in a small parking garage, the tower would prefer to use a conventional low truck rather than a flat-bed. Many tow truck drivers learn how to operate the vehicles with on the job training. There is no specific educational requirement, but many employers prefer to hire high school graduates. When a new hire starts a towing job, an experienced driver explains the safety procedures and company policies. However, like many professions, towing has become increasingly complicated in recent decades, leading to a need for more organized training programs. The Towing and Recovery Association of America (TRAA) offers a certification program for people who already have practical experience in towing. You can either take this training in person or online. TRAA has the only national standards for tow truck operators, and they provide the only National Driver Certification Program, which covers safety, customer service, incident management, truck and equipment. There are three levels of TRAA training. To begin Level I, or Light Duty, training, you must meet all state driving requirements and have at least 90 days experience working on a tow truck in the last five years. After you register for the certification program, TRAA will send you a study guide. You are responsible for reviewing the guide before the test, and you must score at least 80 percent to pass. The Level I test includes 100 questions, which you can either take online or on paper. To do the computer test, you have to go to a specific testing location and make an appointment for the test. The computer version is more expensive, but you can take the test at your convenience and you get your results immediately. If you pass, you will receive your certificate by fax within a few business days. If you prefer to take the test in pencil, then you will have to wait for a set testing date. TRAA administers these exams at Tow Shows and at community colleges. With the paper test, it may take a month to find out if you passed. The Level II certification requires one year of employment as a medium/heavy duty truck towing and recovery operator. You must already hold a CDL ABC and meet all the driver’s requirements for your state. You must also already hold the Level I certification. Since this certification focuses on recovering tractor-trailers and other large vehicles, the exam is twice as long, at 200 questions. The Level III, Heavy Duty Certification is the most involved testing process. You must already have a CDL with endorsements, a Level II Master Tower Certification, and two years of experience as a towing specialist. There is both a written and oral part of the Level III exam. The written segment covers the basic theoretical knowledge that you need in order to safely recover large vehicles. The oral segment is designed to see how you think in a real-life situation. I was in Raleigh for business and leaving to head back home with a 4 hour drive ahead of me. With all the debris in the Raleigh highways, i apparently ran over something that cut the tire on my 2016 Camaro SS. Stuck on the side of 40 when it's almost 90 degrees is not a good situation. Nick with One Direct responded with a call to me to let me know when he'd arrive, showed up as predicted, used the utmost care in loading my baby up and then didn't just do a dump and run when we got to the incredibly unhelpful local Chevy dealer. Instead he waited to make sure they would have the tire, which they didn't, and then he and i located a Discount tire close by who did have exactly what i was needing. Never complained about having to go the extra couple of miles. 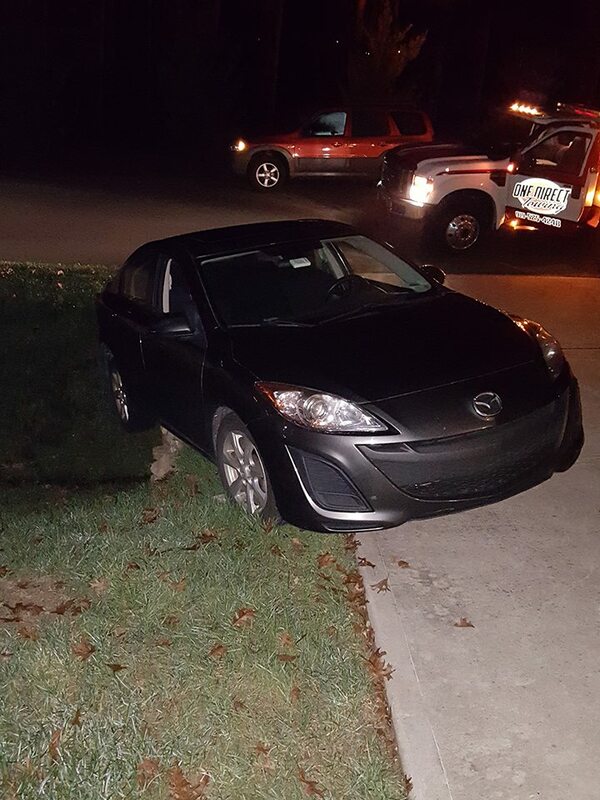 A bad situation made so much better by Nick and One Direct Towing. I sincerely appreciate the quality service and care shown.